GREGORY was a Roman of noble birth, and while still young was governor of Rome. On his father’s death he gave his great wealth to the poor, turned his house on the Cœlian Hill into a monastery, which now bears his name, and for some years lived as a perfect monk. The Pope drew him from his seclusion to make him one of the seven deacons of Rome; and he did great service to the Church for many years as what we now call Nuncio to the Imperial court at Constantinople. While still a monk the saint was struck with some boys who were exposed for sale in Rome, and heard with sorrow that they were pagans. “And of what race are they?” he asked. “They are Angles.” “Worthy indeed to be Angels of God,” said he. “And of what province?” “Of Deira,” was the reply. “Truly must we rescue them from the wrath of God. And what is the name of their king?” “He is called Ella.” “It is well,” said Gregory; “Alleluia must be sung in their land to God.” He at once got leave from the Pope, and had set out to convert the English when the murmurs of the people led the Pope to recall him. Still the Angles were not forgotten, and one of the Saint’s first cares as Pope was to send from his own monastery St. Augustine and other monks to England. 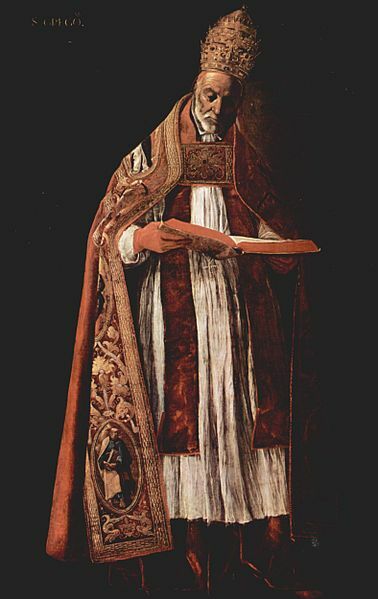 On the death of Pope Pelagius II, Gregory was compelled to take the government of the Church, and for fourteen years his pontificate was a perfect model of ecclesiastical rule. He healed schisms; revived discipline; saved Italy by converting the wild Arian Lombards who were laying it waste; aided in the conversion of the Spanish and French Goths, who were also Arians; and kindled anew in Britain the light of the Faith, which the English had put out in blood. He set in order the Church’s prayers and chant, guided and consoled her pastors with innumerable letters, and preached incessantly, most effectually by his own example. He died A. D. 604, worn out by austerities and toils; and the Church reckons him one of her four great doctors, and reveres him as St. Gregory the Great.